If you're looking for a professional-grade guitar that offers a great balance of style and playability, then you're in luck. Check out the G.. If you're looking for a professional-grade guitar that offers a great balance of style and playability, then you're in luck. 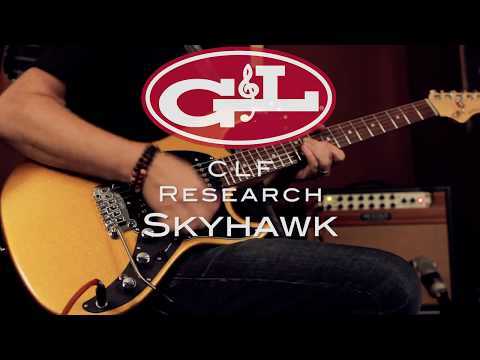 Check out the G&L CLF Research Skyhawk Guitar in Natural Ash - the latest incarnation of G&L's popular 1984 Skyhawk model. With the G&L CLF Research Skyhawk Guitar in Natural Ash you get a high-end electric guitar inspired by the original 1984 Skyhawk. With its comfortably contoured double-cutaway body, slim waist, and arched pickguard shape, this guitar combines incredible levels of playability with plenty of style. Add into this a sleek, "Modern Classic" neck, dual-fulcrum vibrato bridge, and a set of powerful MFD single coil pickups, and you have yourself a true rock and roll machine. Magnetic Field Design (MFD) single coils are Ceramic pickups, specially designed to offer individual adjustment of each pole piece, allowing you to adjust the output of each string on each pickup. These pickups offer a slightly warmer tone than a traditional single coil, with a broader frequency response, and a much higher output, but without any of that dreaded 60 cycle hum. Originally designed by Leo Fender to offer the final word in vintage-style vibratos, the Dual Fulcrum uses two pivoting points rather than the traditional six wood screw attachment. This results in a much smoother, "silky" feel, allowing you to bend notes up and down at will. Controls: 5-position pickup selector, volume, treble, bass (PTB system), mini-toggle switch enabling additional pickup combinations of neck+bridge or all three pickups together.